Can someone explain what these shims are on the X12 setup sheet and exactly where they fit etc? B) There is no reference to this adjustment anywhere in the manual. Is it virtually a standard change to make and what does it do to the handling? 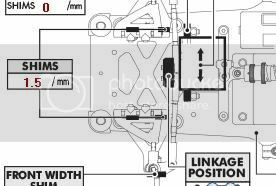 Well as Niall just described in the previous post, a longer upper link decreases camber gain which makes the car easier to drive in high bite conditions. Used by most of the team for most of the time. Me and Olly J both ran 1.5mm at the EC.